Who is Entitled to the Security Deposit at the End of a Residential Tenancy? – Lessans Praley & McCormick, P.A. Home / Noteworthy / Who is Entitled to the Security Deposit at the End of a Residential Tenancy? One of the primary concerns of tenants after the expiration of a residential lease is ensuring that the landlord returns the security deposit in a timely manner. A security deposit is a payment of money given to a landlord by a tenant in order to protect the landlord against nonpayment of rent, damage due to breach of lease, or damage to the leased premises, common areas, major appliances, and furnishings. By law, in a residential tenancy, the landlord may not require a security deposit in excess of the equivalent of two (2) months’ rent per dwelling unit. At the end of the tenancy, the landlord may withhold the security deposit, or any portion thereof, for any of the above reasons; however, the landlord must follow specific steps to capture the deposit without consequence. If the landlord withholds any portion of the security deposit, he or she must present the tenant with a written list of damages claimed, together with a statement of the cost actually incurred. The list must be furnished by first-class mail to the last known address of the tenant within forty five (45) days after the termination of the tenancy. If the landlord fails to comply with this requirement, the landlord forfeits the right to withhold any part of the security deposit. Should the landlord fail to return any portion of the security deposit, along with interest in the amount of three percent (3%) per year, without first providing a written list of damages along with the statement of costs actually incurred, the tenant has an action up to three (3) times the withheld amount plus reasonable attorney’s fees. The law provides for such strict requirements to ensure that the landlord does not wrongfully withhold any portion of the security deposit without substantial justification. 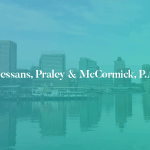 The attorneys at Lessans, Praley & McCormick, P.A. frequently represent both landlords and tenants in all stages of residential and commercial tenancies. If you are a landlord or a tenant involved in a dispute regarding the return of a security deposit or have other residential or commercial landlord/tenant issues, call 410-760-5000 to schedule a consultation with one of our landlord/tenant attorneys.